Welcome, When you are on the sea on a boat with your friend and family enjoying your time with a joy; you like the hard jobs done for you, so here we are Gullet charters are the best. We do all driving, cooking and planning for your charter and all you have to spend your precious time for your self with beloved people, reading books and swimming in turquoise water. 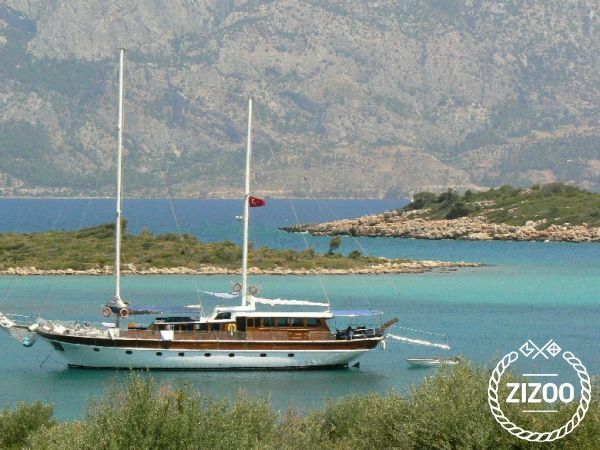 Our Gullet and crew will take you crystal clear waters, cooking delicious cuisine and make you feel comfortable. Our gullet is 25m long with a spacious feeling and our 6 double bed cabins will give you lavender sleep. Chef keeps cooking for you all day in the galley. Dinner area at the aft and relaxing under the shade from the strong sun is, also aft. You can also eat out in Ristorante or Taverna on shore. The aft of the boat also gives you breeze from hot sunny summer. If you like more tan in the sun we have sunbeds at the front of the boat. Our saloon is for you to use dropping everything and it is useful on windy days. It is easy to getting in and out from the sea with our side ladder and there is fresh water tap right next to it for you to wash the salt from your body. You don’t have to bend or squash anywhere on the boat, lots of space for everyone. We have Kayaks and some water toys for fun times and also a dingy for exploring the shore. Once you pay, there are no more extra charges, we cover all expenses for your charter like Harbour charges, transit log, provision, and ext. so you only know one price for all and no more extra and surprises. Our offer you are taking your friends and family for a great union and happy times on board and let us show to you our hospitality. Owner-operator me Captain Clive in Corfu. 25 years experience in marine fields and running this Gullet for 11 years. I have delicately selected the crew for work on the boat with me is for your comfort and enjoyable tours. A good chef and smiley face deckhands with me welcome you on board.